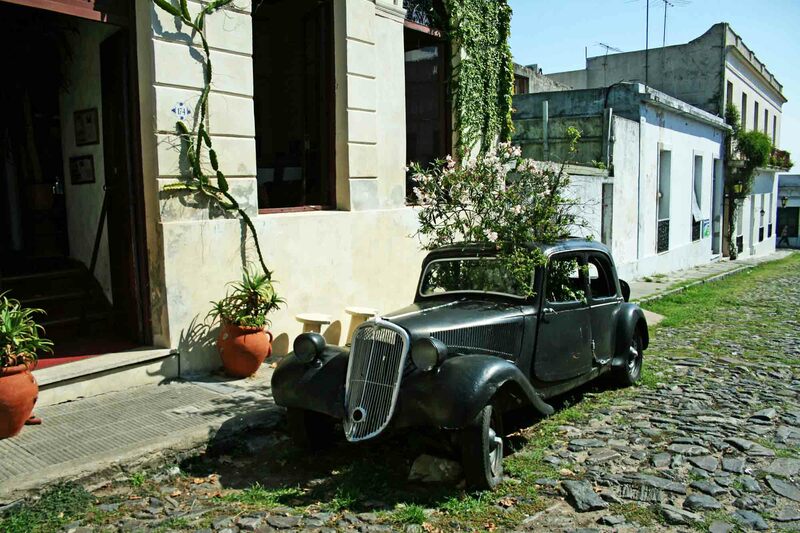 If ever you chance to visit Buenos Aires or Montevideo, spare some time to travel from these modern, bustling cities to a small town nearby where time has stood still – Colonia del Sacramento. I was visiting Buenos Aires on a Round The World trips, and had sampled the usual tourist attractions, from La Boca Juniors football stadium to a Tango Show. I still had one day left; not long enough to travel to the Iguazu Falls and I didn’t fancy a long road journey to visit a town in the pampas. Then I remembered my son’s advice when he learnt I was visiting Buenos Aires. 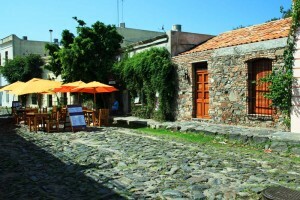 ‘Go to Colonia del Sacramento. It’s your sort of place.’ My son is well-travelled and even has his own Travel Expert website, so I normally listen to his travel suggestions. When I checked the map I realised that Colonia del Sacramento is 30 miles away from Buenos Aires, across the River Plate in Uruguay. But that turned out to be just a 40 minute ride on the Buquebus fast ferry. I booked the tickets a day ahead and arrived one hour before the ferry’s departure time. The time is needed to get through immigration control and to collect some Uruguayan pesos. So was it my ‘sort of place’? Yes, definitely. I’m quite a heritage aficionado, so this UNESCO World Heritage Site provided a great day out, with the ferry trip across the River Plate adding to the enjoyment. Many of the buildings and streets in the historic centre date back to the 17th and 18th Centuries, when the town swung several times from Portuguese to Spanish colonial rule. The central area is fairly compact and easy to stroll around, although care must be taken on the uneven cobble streets. It was a joy to sit in the peaceful central square between the trees and slip back 300 years in time. That was until a frozen food van from McCain Chips of Scarborough, England, screeched to halt beside us and broke the spell! 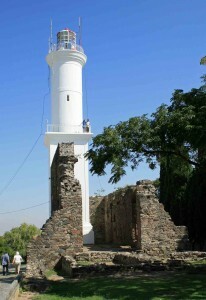 • El Faro Lighthouse. This is a good place to start your visit; the 360-degree view from the top let you get your bearings before setting out to explore. It was built in 1857 on the ruins of the 17th Century Convent of San Francisco. • Promenade Walk. 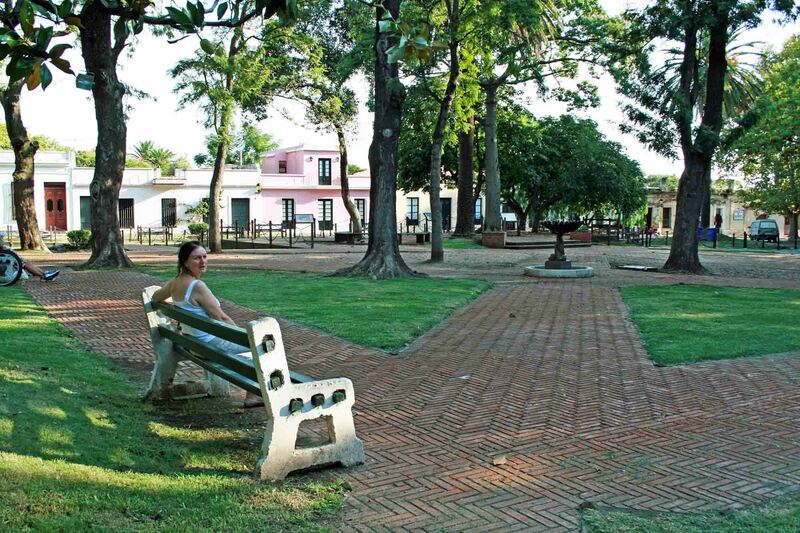 Before entering the old town, take a stroll along the waterfront promenade with great views across the River Plate. • Puerta de la Ciudadela, also called Puerta de Campo. The gate with a drawbridge, built by the Portuguese governor in 1745 as the only entrance through thick walls, is a great way to enter the central historic area of Colonia. • Barrio Histórico (Historic Quarter). Travel back in time as you try to spot which are the old Portuguese houses and which Spanish. The same goes for the cobbled streets – some Portuguese, some Spanish. And, every so often, there is an old vintage car – it’s all a bit surreal. • Plaza Mayor. I found it pleasantly cool to sit awhile in the central square beneath the trees. Mid-afternoon, it was peaceful and almost deserted… until the McCain van arrived. Two of the three museum mentioned below are on the Plaza Mayor, the other is just a short distance away. • Museo Español, Museo Portugues and the Museo Municipal. You may have gathered from previous posts, I’m not that keen on museums and tend to visit them only as a refuge in bad weather. However I made an exception in Colonia, in that the three museums were relatively small and contained fascinating artefacts from the Portuguese and Spanish colonial time. 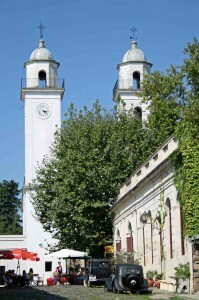 • Basílica del Santísimo Sacramento. Not the most impressive of churches, but the stone building dating back to 1808 dominates the central area and it has an attractive interior. • Plaza de Toros. This strange Bullring is worth venturing a little way out of town to visit, if only for its curiosity value. It was built in 1910, but saw only 8 bullfights before bullfighting was banned by the Uruguay government in 1912. Since then it has slowly fallen into decay. • The Beach. If you travel out to the Plaza de Toros, then head to the waterfront close by with its white sandy beaches and ruined jetties. • The Ferry Trip back to Buenos Aires. 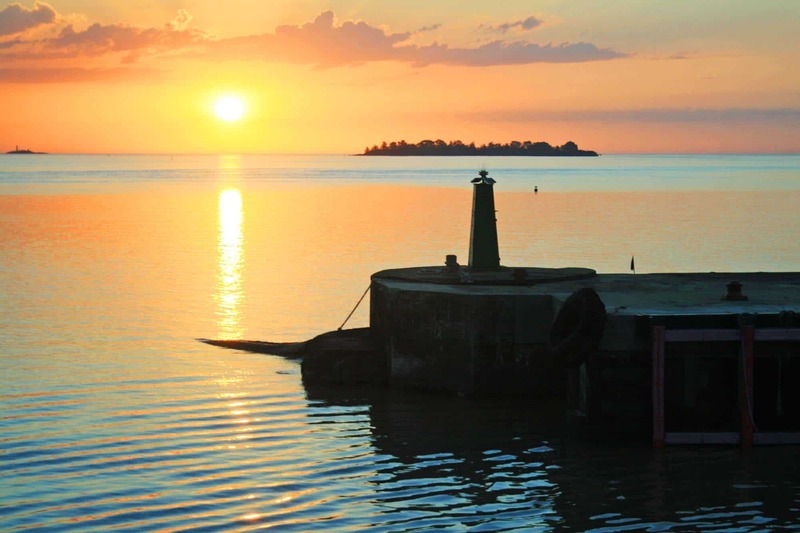 If you time it right, as I did, and also arrive early at the ferry terminal to get starboard seats, then you may enjoy a spectacular sunset over the River Plate as you journey back to Buenos Aires. 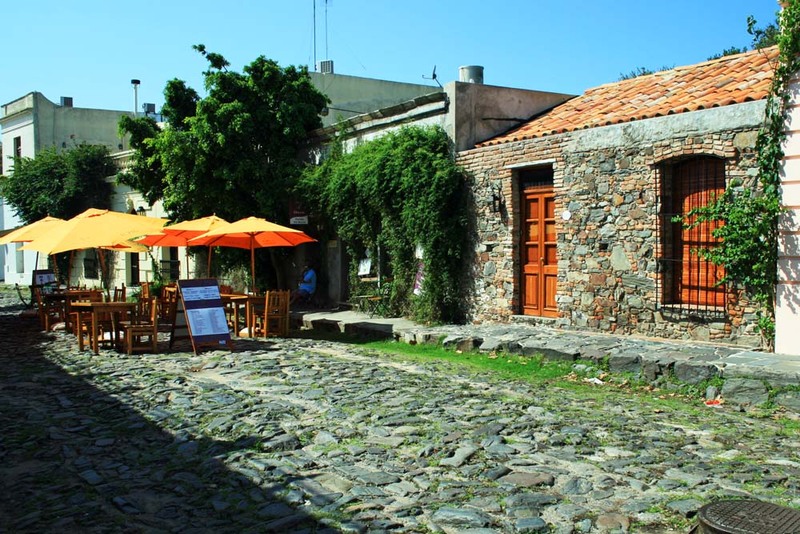 I’ve read a couple of negative comments about Colonia Del Sacramento made by younger travellers who maybe found the city just a bit too quiet and laid back. But that to me, and I suspect many Senior Travellers, is the charm of Colonia. I very much enjoyed strolling around the historic, cobbled streets, pausing along the way for a refreshing glass of the local Tannat red wine.